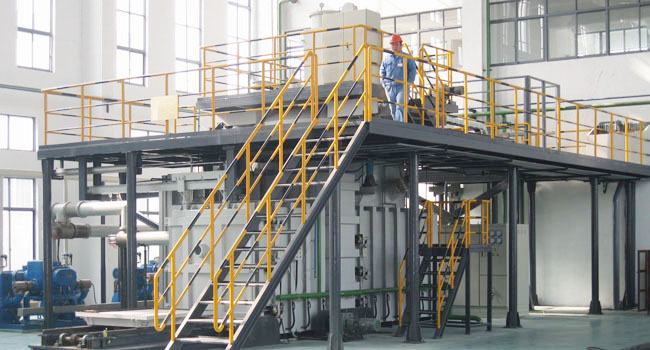 Vacuum induction melting equipment produces ultra-clean ingots, which are further refined by electrode remelting.In general, before rolling or forging, it is melted by vacuum arc remelting (VAR) process, and then processed into final products such as engines, transmission devices and structural parts in aerospace field. After pouring, the ingot molds filled with molten steel are transported to the stripper zone by rail car. After a few hours, the solidified ingot is demulded and placed in an insulating enclosure for slow cooling to prevent cracking of the sensitive steel. As the entire smelting and pouring process is conducted in an oxygen-free environment, the treated steel is very clean and the gas content is very low. This process can also obtain very strict component deviation.In the vacuum state, there is alloying process to precisely control the chemical composition of the product steel.Smelting in an oxygen-free environment prevents the formation of oxides, reduces the loss of elements with oxygen affinity, and removes excess associated elements. The ingots are then further refined through a vacuum arc remelting (VAR) device before being rolled or forged into aerospace products such as engines, conveyors and structural parts.